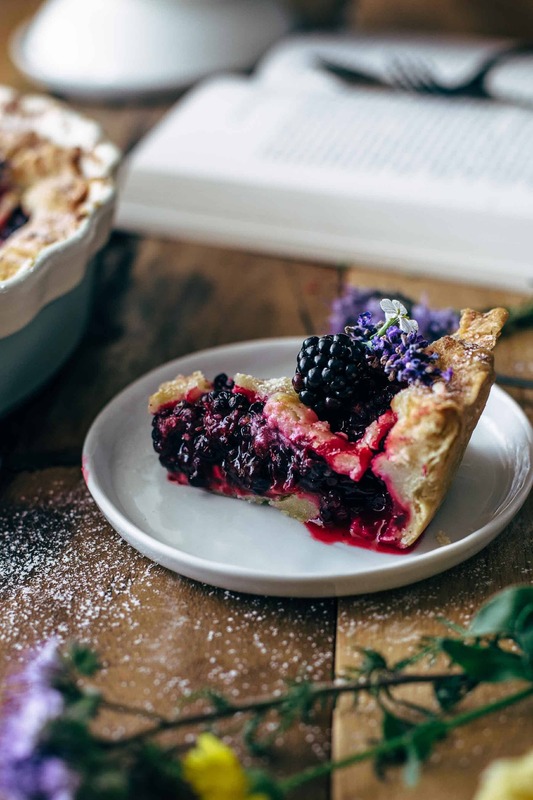 Super delicious Blackberry Pie from scratch with just 10 ingredients and 15 minutes of active preparation time. Filling made from fresh blackberries. Super flaky pie crust. What fits better to summer than pie? 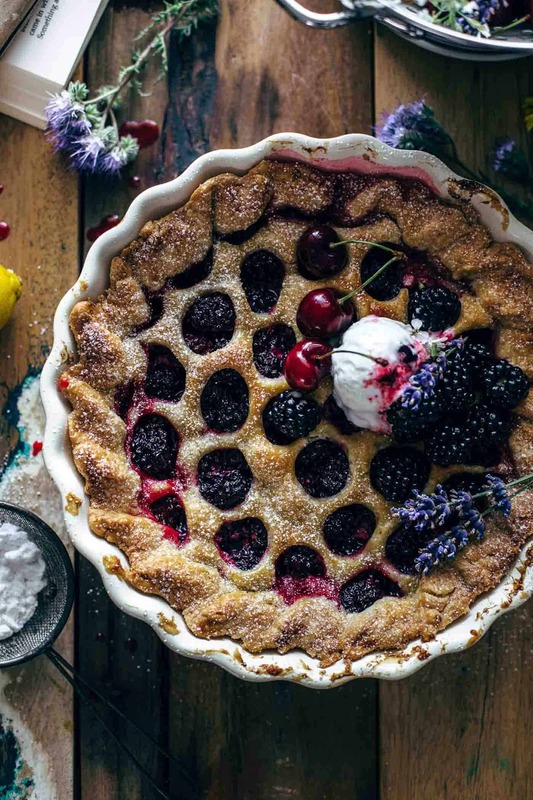 A flaky and buttery pie crust filled with super delicious fresh blackberry filling topped with a big scoop of vanilla ice cream. You are going to be in heaven! Blackberries are not your favorite kind of berries? Absolutely okay, swap the blackberries for your favorite berries, or mix different berries. A combination of strawberries, blueberries, and blackberries is outstandingly delicious. Or cherries? Cherries are awesome too! Eating lots of berries in summer is an essential thing and totally natural to me. Not just that they are super delicious and so versatile, they offer a lot of health benefits either. On hot summer days, I love to eat berries straight out of the fridge and on top of a big bowl of Greek yogurt. Did you see the White Chocolate Cupcakes with White Chocolate Frosting what I posted recently? I’m thinking about to bring chocolate and berries together. Let’s see what comes to my mind. As you might know, all recipes on my blog are made from scratch. I never use any store-bought pie crust or would never use cake mix. Not that it is bad to use these products. 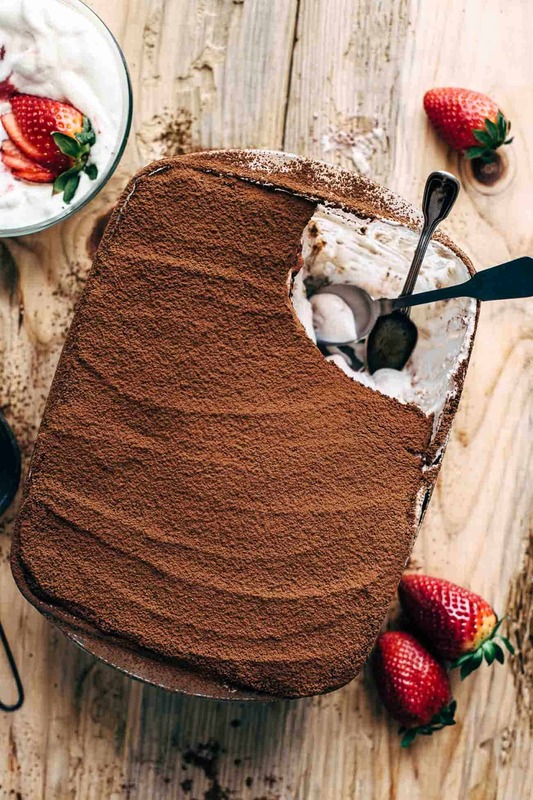 But I think you don’t need to read a blog post about making a cake with cake mix. I want to offer value and want to bring you the confidence to bake from scratch. The most of the recipes you find here are easy to make and follow, even for less experienced bakers. Maybe your very first pie is not the prettiest one. That is totally normal. I’m a self-taught baker, and my first recipes weren’t pretty at all. I could show you some super old iPhone snaps from cookies or muffins. You would laugh. But baking is a journey. And a passion. It needs patience, passion, and love to get better and better. And the most important thing: you create something you love with your own hands and your family and friends will honor this. The moment when Mario is biting into something I baked and his eyes are glowing, and I hear that desired „mmmhhhh“ makes me beyond happy. The pie crust is made with very basic ingredients you probably always have at home. All-purpose flour, sugar, salt, butter, and water. The easiest way to make pie crust is with a food processor. Therefore, place every ingredient except the water in the food processor and pulse a few times until it resembles a coarse structure. Pea-sized and larger butter pieces should be still visible. Add 1 tablespoon water at the time and pulse 1-2 times. The pie crust will start forming larger crumbs which stick together. Depending on the humidity just 5 tbsp of water could be enough or a 7th is required. Just check the consistency. Watch the video to see how it should look like. If you don’t have a food processor, then make the double pie crust with a pastry cutter or two forks instead. You can find the instructions in the recipe below. Chill the dough at least 2 hours, preferably overnight. You can make the pie crust up to 4 days in advance. That you have it as easy as possible when rolling out the dough, divide dough in half, and form to 1 – 1,5 inch thick discs. Wrap tightly in plastic wrap. When rolling out the dough, you see that beautiful marbled pattern from the butter pieces. The butter pieces make the dough super flaky. The filling is made of blackberries, lemon juice, vanilla, sugar, cornstarch, and a pinch of salt. We have 5 heaping cups blackberries in the filling. 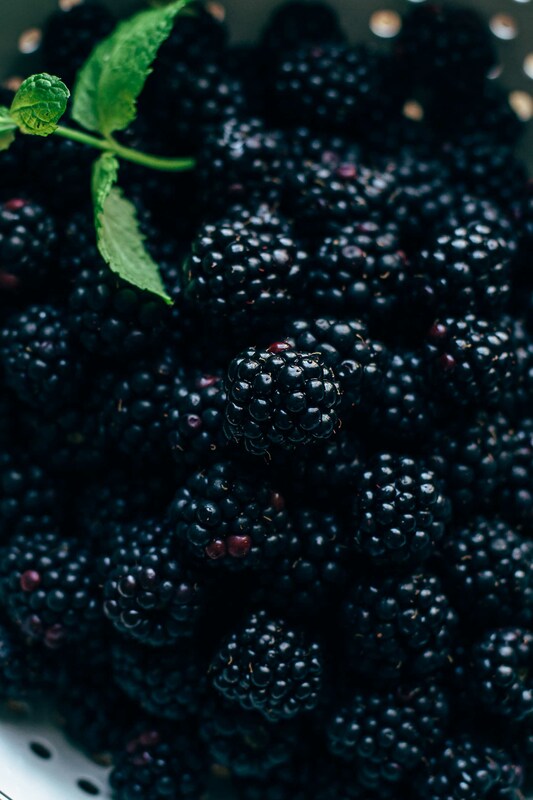 The vanilla, the lemon juice, and the salt are supporters of the blackberry flavor and help the blackberries to pop. 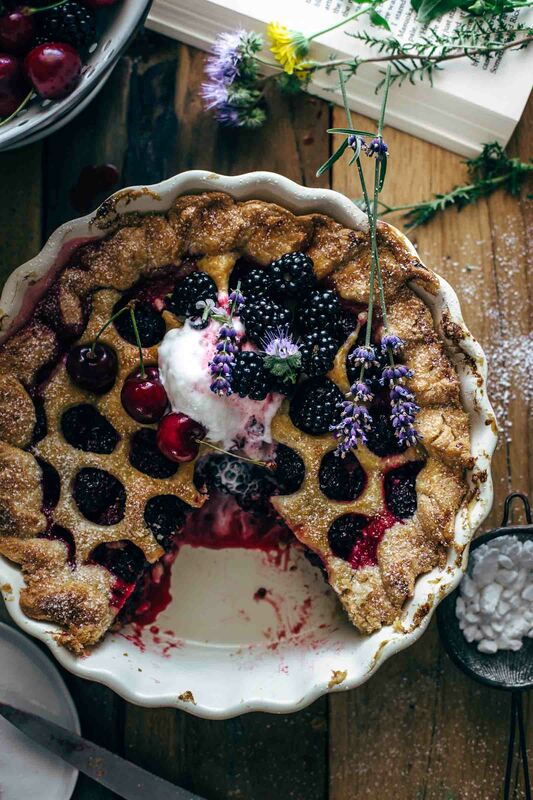 A half cup of sugar makes sure that our Blackberry Pie is sweet but not overly sweet. The cornstarch soaks up the liquid and thickens the filling. Combine all ingredients and stir to combine. Let stand until you are done with rolling out the pie crust. Then spoon the filling on the bottom layer pie crust without any excess liquid. Don’t pour the excess liquid on top of your pie crust. Otherwise, your pie crust will get soggy. When it comes to pie crust designs, my advice is: be creative. 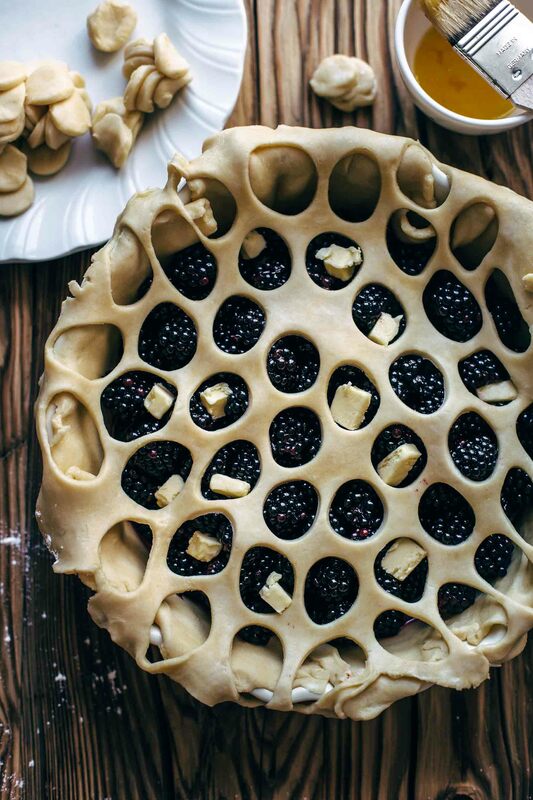 Make a lattice, cover the pie completely and cut just a few slits on top, cut out some hearts, stars, leaves, or circles. Do whatever you like the most. I don’t have a favorite pie crust design. I love them all. After baking let the pie crust cool down to room temperature for best cutting results. 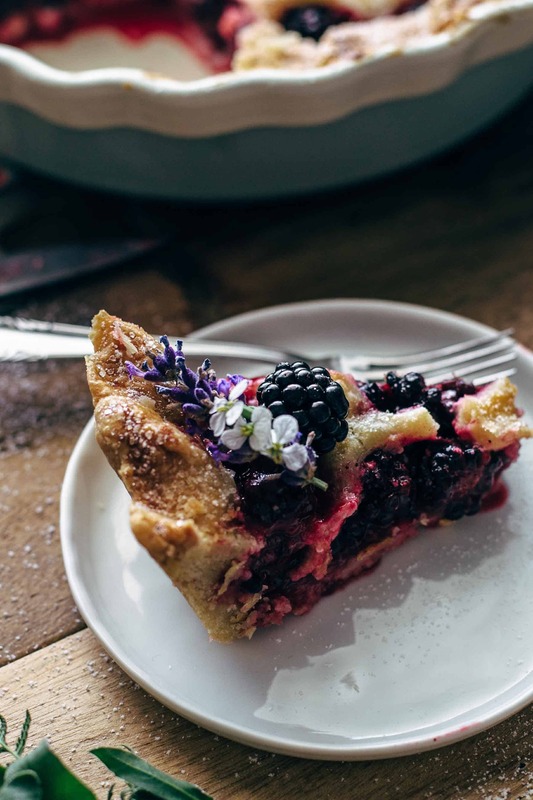 If you want to have warm Blackberry Pie, microwave a slice for 15-20 seconds until it is slightly warm. 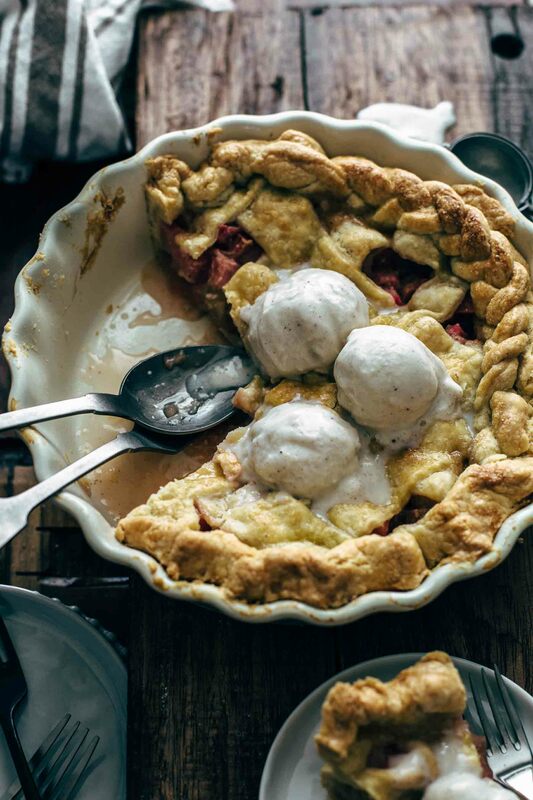 Place a scoop of ice cream on top and watch it how magically it melts down over your pie. Do you know what is a very good ice cream flavor to this pie? I mean besides vanilla? Vanilla ice cream with a cherry swirl. That is to die for!! Or think of chocolate ice cream on top!! Heaven!! 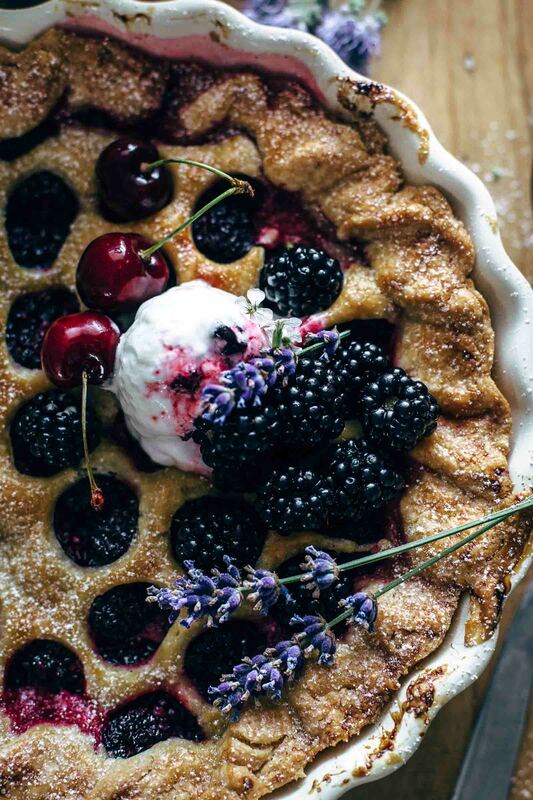 If you make this Blackberry Pie recipe from scratch leave a comment, rate it and tag a photo #alsothecrumbsplease on Instagram! Would love to see your snap! 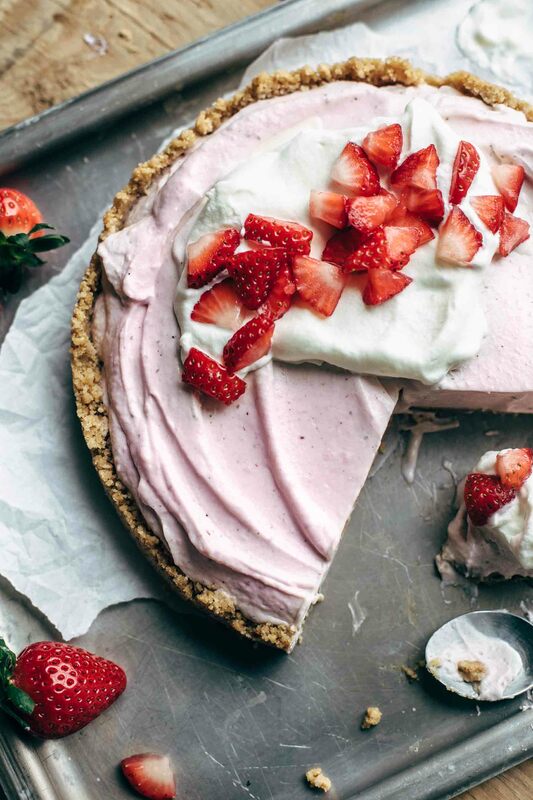 You may also like Easy Rhubarb Pie Recipe From Scratch, Easy Blueberry Bread Recipe, No-Bake Strawberry Cream Cheese Pie Recipe, Super creamy Chocolate Strawberry Tiramisu, or click here to see all recipes. Make the double pie crust with a food processor: Place flour, salt, sugar, and butter in a food processor and pulse 4-5 times. Pea-sized butter flakes should still be visible. Add one tablespoon water after another and pulse 1-2 times after every tablespoon. Stop adding water when the dough starts to clump. Watch the video to see the required consistency. Divide pie crust in half and form 1 - 1.5 inch thick discs without kneading. Cover tightly with plastic wrap and refrigerate at least 2 hours or up to 4 days. In a large bowl stir together blackberries, lemon juice, vanilla*, sugar, cornstarch, and a pinch of salt and stir to combine. Set aside. On a lightly floured surface roll out the first dough disc into a 12-inch circle. Transfer to a 9-inch pie dish. The edges of the pie crust should hang out of the baking form. Spoon filling into the pie crust without any excess liquid. Discard any excess liquid. Then cut butter into small pieces and put on top of the filling. Roll out second dough disc and place on top of the filling. Cut slits on top that the steam can escape, or cut out circles, hearts, leaves, to your preference. Or cut the second dough disc into 1-2 inch strips and arrange in a grid on top of your filling by laying over and under one another carefully. Seal and flute the edges. Brush with egg and sprinkle with sugar. Bake for 45 minutes. Cover the last 10 minutes with parchment paper to prevent it from browning too much if needed. Let cool to room temperature and chill for 4 hours in the fridge. Store leftovers in an airtight container in the refrigerator up to 3 days. omg. This pie. 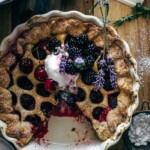 I cannot tell you how much I adore blackberries and your pie looks amazing! 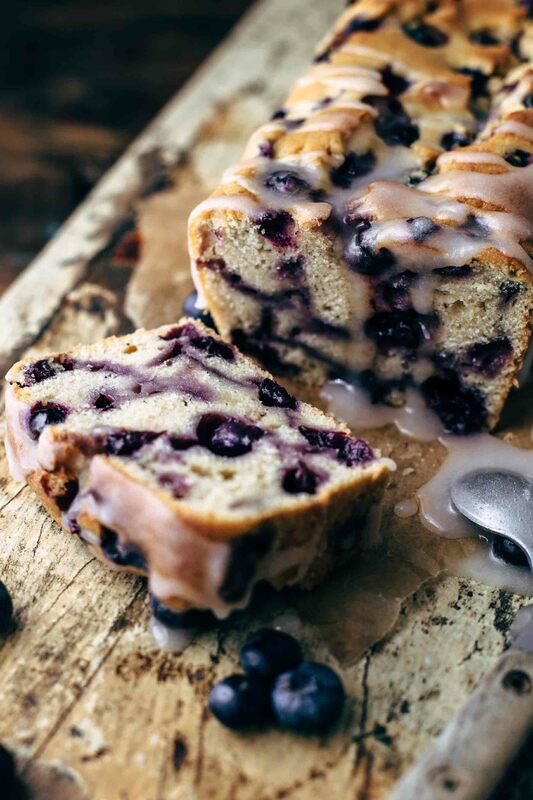 I am all over your website today and am super fan-girling over your recipes and photos! Heather, you literally made my day! You are the best! Thank you so much for your nice comment! Looks delicious. You mention a video but I can’t seem to see it. I am sure it’s right in front of me but can’t seem to see it. Sorry to also be negative but I realise ads are an important revenue but I get frustrated when every second image in the middle of a post is an ad. It makes me not want to read on. Thank you so much for your feedback, Emma. It is important for me to know how my readers think about my blog. I will take a look at the ad settings and will try to optimize it. The video is on top of the post when using a desktop and right before the recipe card when using a smartphone. Have a great day! Thanks, will have a look on the desktop but on my iPad does not seem to show up.